The setup guide is currently being updated, some information and/or screenshots may not be up to date yet. This section describes the software and how to use it. This section focuses on the game settings. 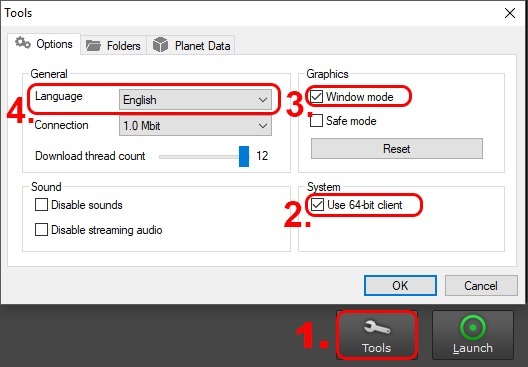 Before you start the game, open up the 'Tools' window in the client loader. The smoother your game runs the smoother the bot will operate. 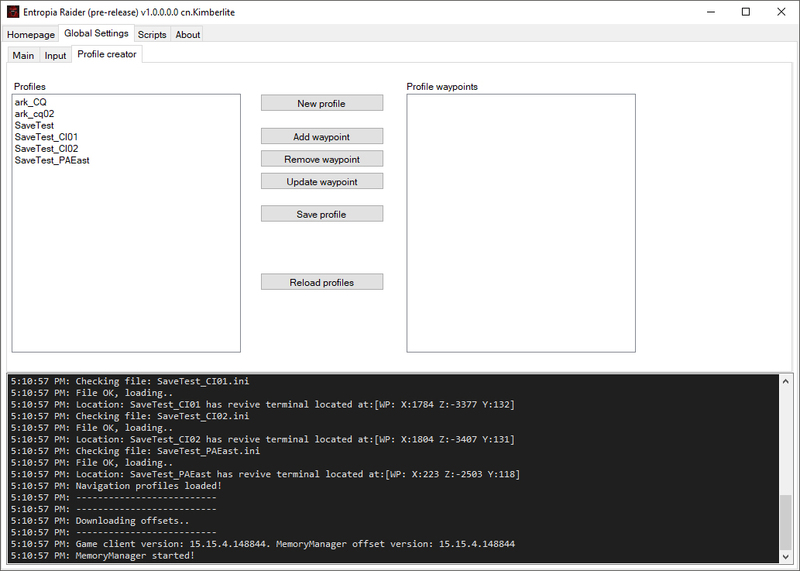 The bot depends on reading multiple things from chat, like damage dealt and received, creature states messages, planet and position information etc.. Chat messages are stored in a chat.log file where the bot can access and process them. To have the chat log file active you must enable it in the in-game options. To enable the bot to control your character after it has sent a chat response (asked for healing, thanked, etc.,), disable 'Keep Main Chat Focus When Entering Text'. Increasing the rotation speed is also recommended. The bot uses the default control keys to move and rotate your character. These are, W,S,A,D for movement and Z,C for rotation. Rotation keys can be changed in the settings. 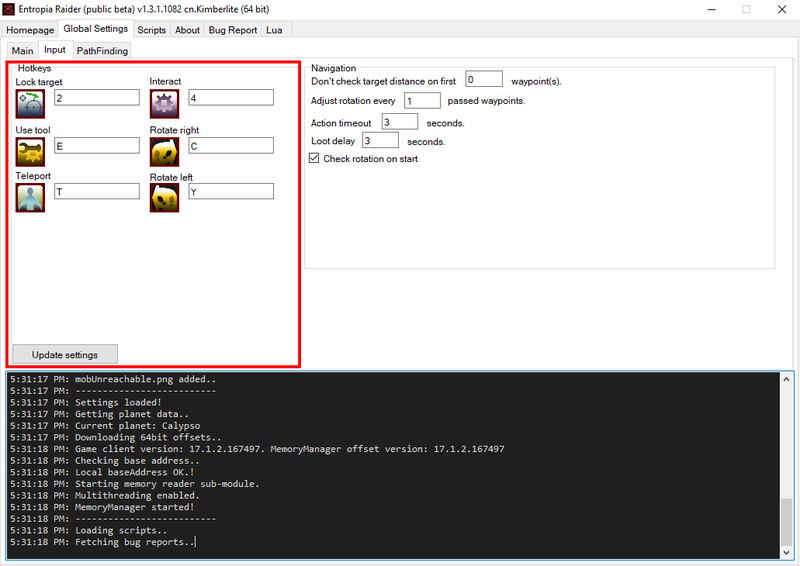 In the example below, keys 1-5 are used to target, engage, and loot creatures. These too, can be changed in the settings. The Action library can be accessed by pressing the 'Y' key, from there, drag and drop the action icons required by the script on the desired keys in the keyboard map. 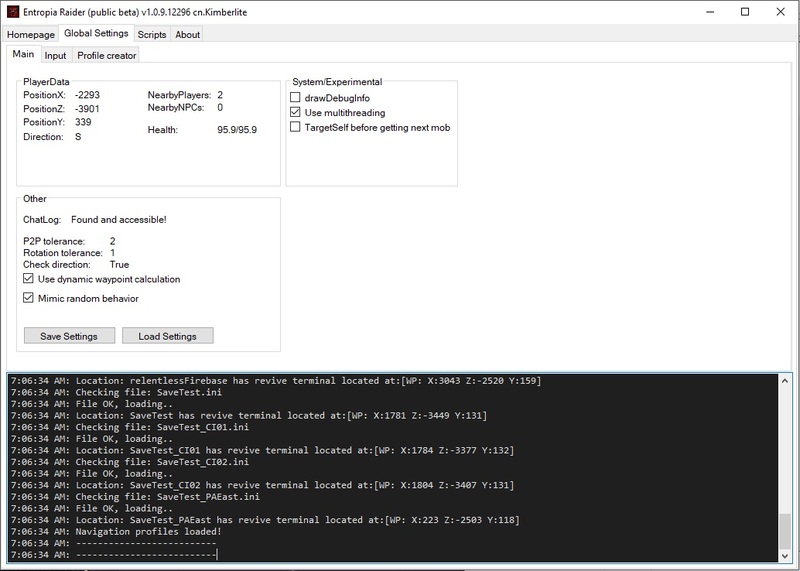 NOTE: The use of "UseTool" on key 5 is deliberate, it is used by the hunting script to validate targets. This section describes how to register an account, download and update the client. 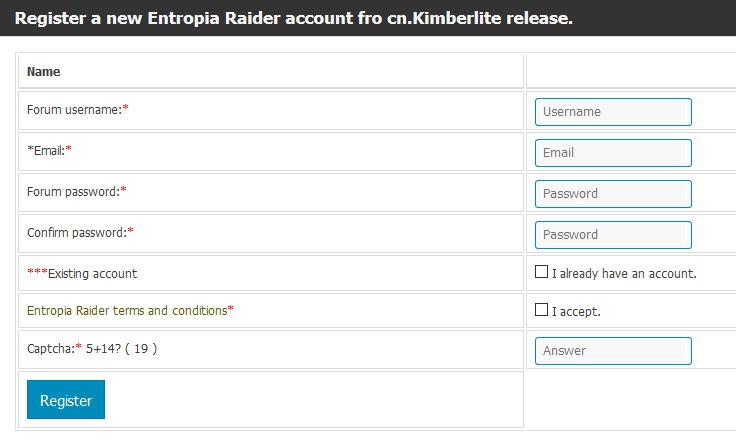 Before you can start using Entropia Raider, you'll need an account. The registration requires an email, username, and password. 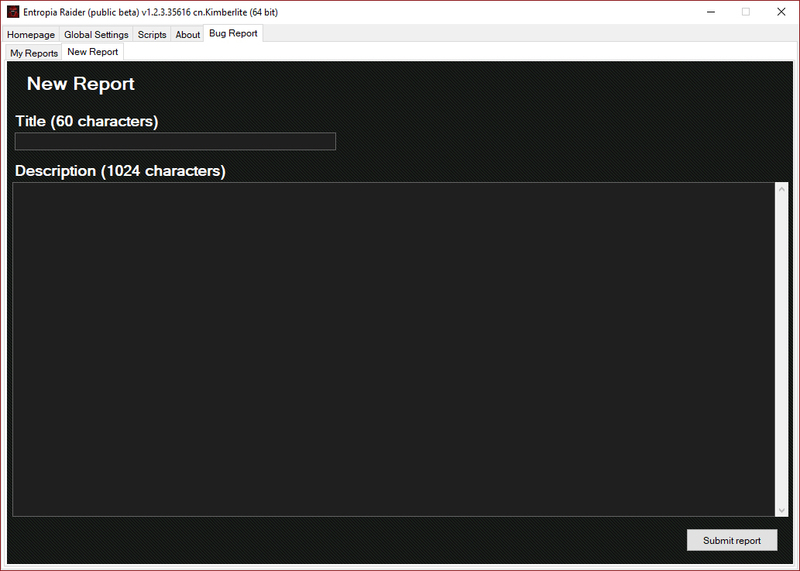 Remember, you should NOT use the same password twice online - and you especially should NOT use your Entropia Universe log in details for this site. E-mails are not validated so feel free to use a fake one. The username and password are used to register you on the forum. If you do now wish to register on the forum, check "Existing account". 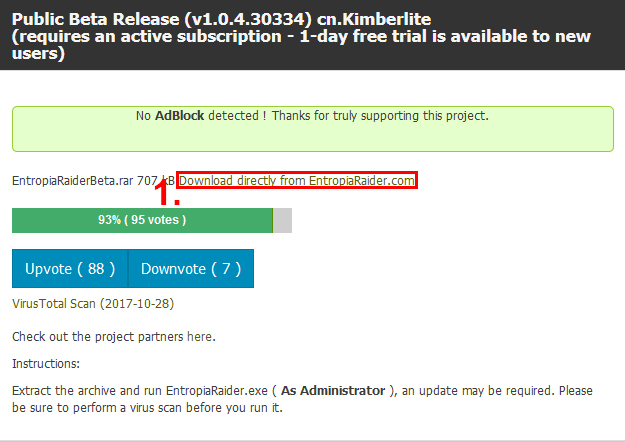 Entropia Raider does NOT require installation, simply download it, extract the .rar archive and run EntropiaRaider1_0.exe. 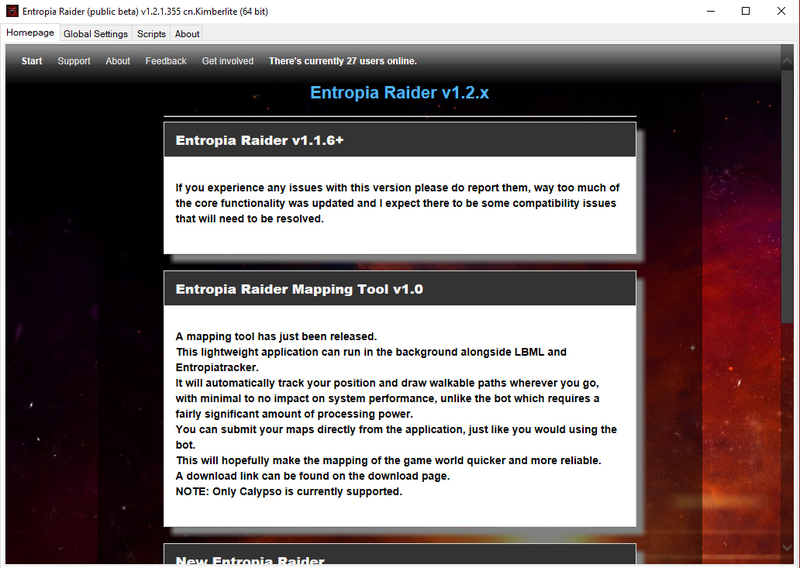 Similarly to its predecessor, Entropia Raider 1.0 also comes with an updater. 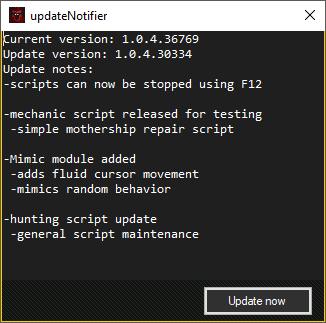 Upon logging in, the bot will let you know of any new updates via an update notifier. Clicking "Update now", will run the updater, which will automatically download all the required files. Enter the email you used during registration to login. This section describes the client in greater detail. This section describes the individual tabs and their content. The homepage tab features an embedded webbrowser control. It will likely be used for updates, news and other information. 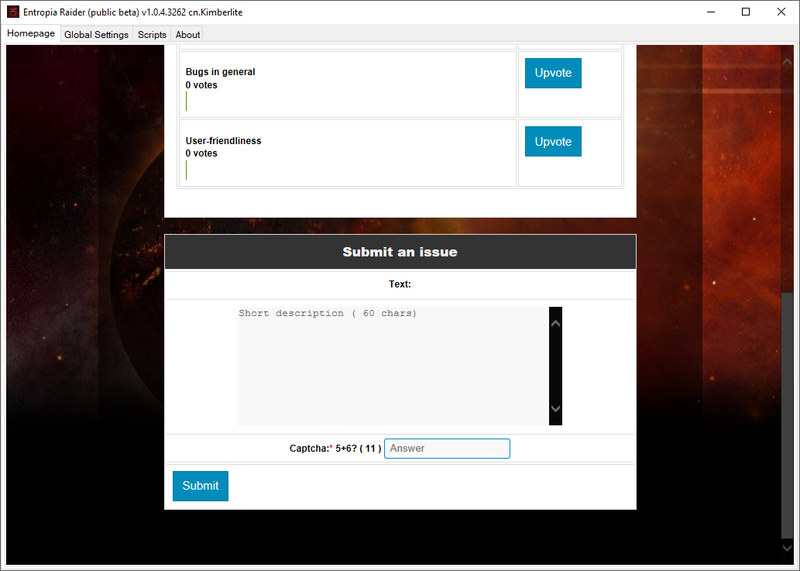 Users can now also view and submit bugs and suggestions directly from the client. You can also do so on the website, HERE. The main tab features general information about your avatar, as well as various debug functions and miscellaneous settings. The Input tab is where you set your controls and navigation preferences. Each time something is changed, the settings should be updated. The Profile Creator tab is where you can create/edit your custom navigation profiles. To create a new profile, click "New profile". Continue to add waypoints until you reach your desired destination. Click "Save profile", name it, and you're done. What is this? 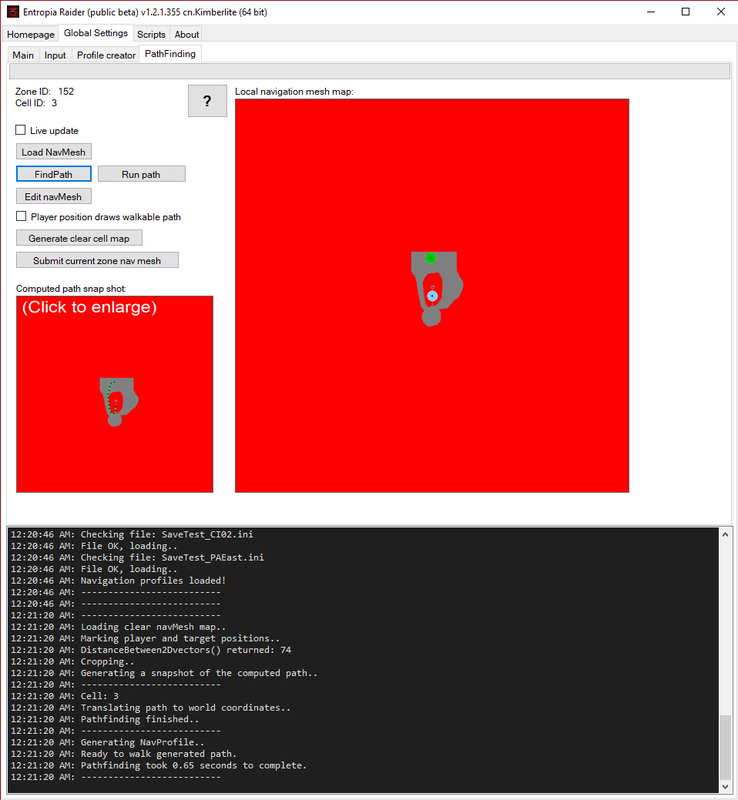 This is a pathfinding module, it allows the bot to automatically calculate a path between two points. It utilizes navigation maps, simple 24-bit bitmaps, to figure out where it can and cannot move. How do I use it? The scripts use it by default, you don't even need to use this tab unless you wish to specifically test this function. When you start a script it'll ask you to pick a target location, you can either right click to pick a location, or chose to use the old navigation profiles. First, click on 'Load NavMesh' to load a navigation mesh for your area. The red pixels in the image indicate unexplored or unwalkable areas. The gray pixels indicate areas the bot consideres walkable. The blue circle in the center of the local navigation map box is your avatar position. 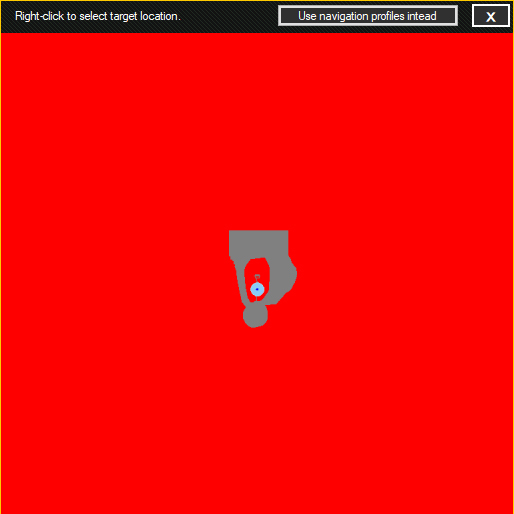 Once you have loaded a navigation map, you can right click anywhere in the local navigation map box, this will mark the target area with a green circle. Once you have marked a target, you can click on "Find path" to have the bot figure out how to get there from whereever it currently is. If the pathfinding succeeds, the "Run path" button gets enabled and you can have the bot run through the calculated path. Can I edit the navigation maps? Yes, you can either edit them directly from the bot, or open the maps in any graphics editing software. Editing through the bot allows you to draw both red(unwalkable) and gray(walkable) paths. It is highly recomended you use the mapping tool instead of the bot editor, as it's much faster, easier and less demnading than the bot. To begin editing the map, make sure it's loaded first by clicking the "Load nav mesh" button. Next, click the "Edit navMesh" button. You can now draw RED(unwalkable) paths in the local navigation map box by clicking and dragging your mouse. To draw walkable paths, check the "Live update" checkbox. Next check the "Player position draws walkable path" checkbox. Finally, click on "Edit navMesh". You can now minimize the bot, and play the game as usual. The bot will monitor your position and draw walkable paths whereever you go. You can see it live if you enable "draw debug info" in the main settings tab. Do keep in mind that this requires a significant amount of processing power, and is not recommended on mobile processors. Also, do NOT use vehicles while editing the map, the position information is all over the place when inside a vehicle. When you're done editing the navigation mesh map, click on "Save changes". If you mess the nav mesh up while editing, you can click on "Generate clear cell map" to generate a clear map. I've mapped quite a big area, how do I send you my maps? Excellent! You can submit the maps of your current zone using the mapping tools upload function. Before you do that, make sure you have saved the changes. This will create a directory for your entropia raider account on my server and upload all 4 cell maps for the zone you are in. You can see the upload progress both in the application output and in the progress bar on the top. If you have any questions regarding any of this, submit a support ticket and I'll get back to you asap. The scripts tab is where you will find available scipts, simply click "Run script" to run one. 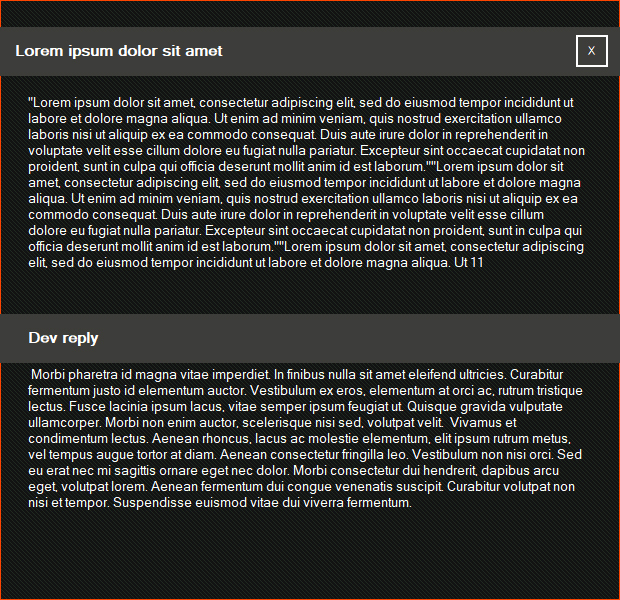 The About tab features general information about the client and your account. The Bug Report tab features built-in ticket/bug report system. 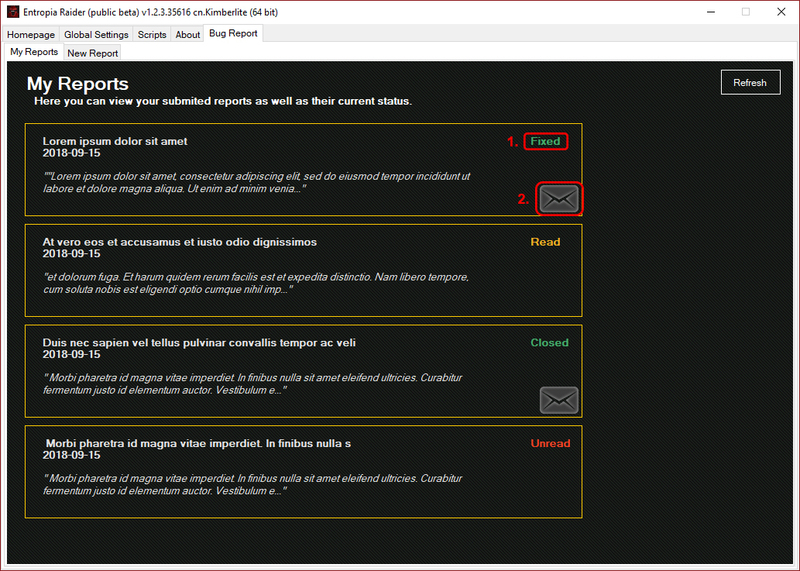 Every report is now properly stored in the database and has a status indicator(1). It also allows me to directly reply to your reports either providing support/solutions or in case it's a more serious config issue directing users to the live support. 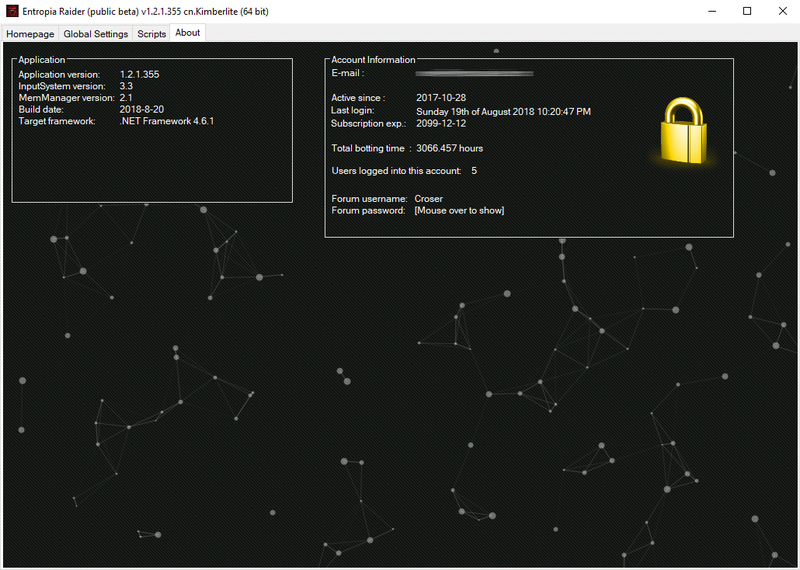 Your reports are be stored indefinitely and not limited in any way. Except of course the lenght of the report and number of open reports, which is limited to 3. (2.) Reply indicator, indicated whether or not the report has been replied to by the developer ie. me. Clicking a report from the list brings up a window containing the full thing. The 'New Report' tab allows you to quickly and easily submit a report. The program utilizes a technique called keyboard hooking. It is used to capture the keys pressed on the keyboard, that are sent to the operating system, even if the application does not have focus. 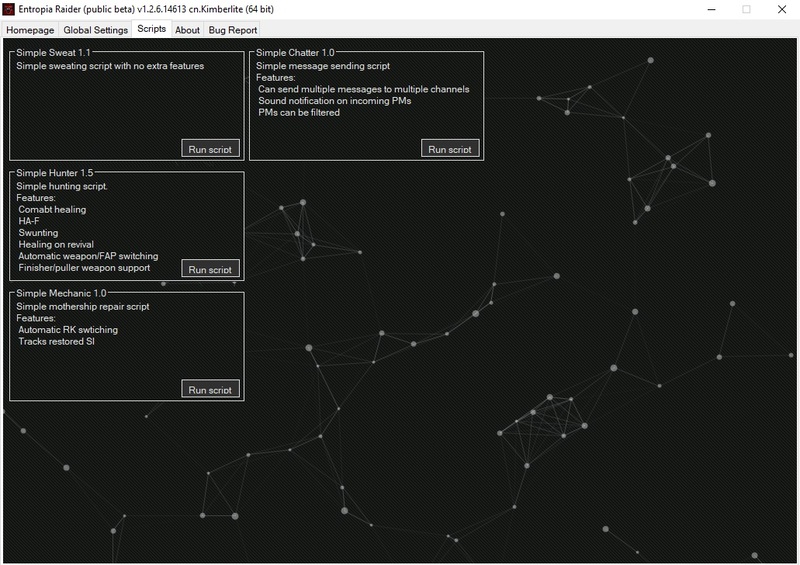 This technique enables you to safely and quickly terminate any running script, add waypoints without having to constantly Alt+Tab and click buttons, etc.. 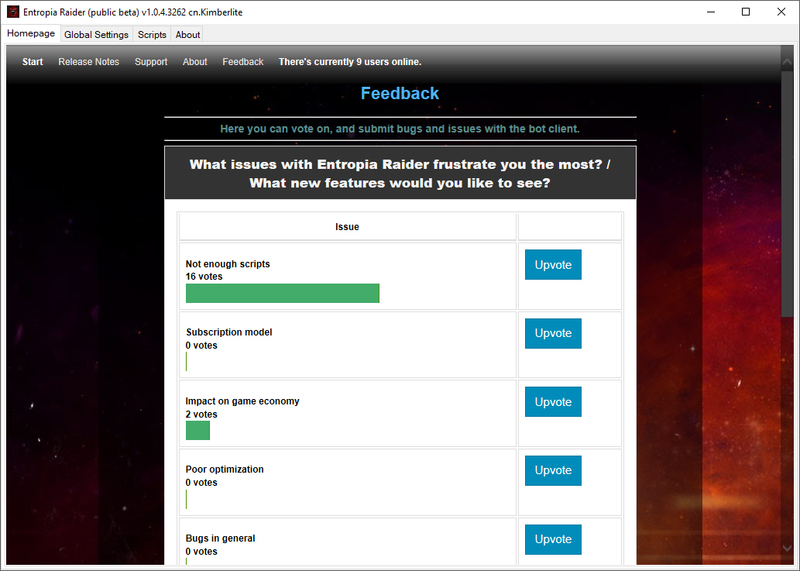 I recommend running the bot after you log in to Entropia Universe, and shutting it down after you end your game session or for the time periods where your sensitive information is exposed by you typing it on your keyboard.